One reason I love July is the abundance of herbs growing in my garden.They are beautiful additions to the landscape and they smell wonderful when you brush past them. My favorite thing to do is incorporate them into new and old recipes alike. I like to enhance my meals with a fresh and earthy quality only herbs can provide. 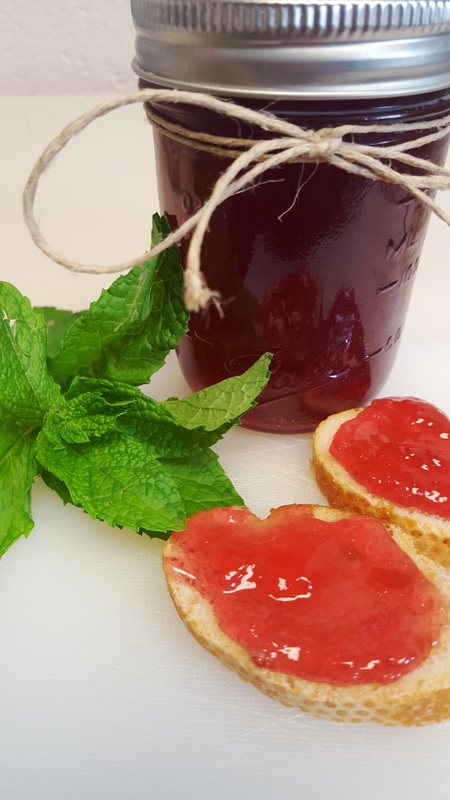 If you like herbs and homemade jelly...you will fall in love with this Herbal Jelly recipe. You can mix and match herbs of your choice and you can also throw in some dried edible flowers. 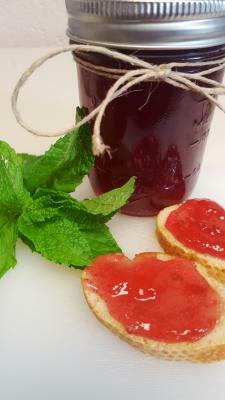 I used hibiscus flowers which turned the jelly a vibrant pink. For this particular recipe I used the following herbs: pineapple sage, mojito mint, lemon balm and thyme. I also used dry white wine instead of apple juice. Mama mia! COMBINE herbs, apple juice, water and vinegar in a large stainless steel saucepan. Bring to a boil over medium heat. Remove from heat, cover and let steep for 15 minutes. Stir well, pressing herbs to extract flavor. TRANSFER herb mixture to a dampened jelly bag or a strainer lined with several layers of dampened cheesecloth set over a deep bowl. Let drip, undisturbed, for 30 minutes. Measure 3 1/4 cups herbed juice. TRANSFER herb juice to a clean large, deep stainless steel saucepan. Whisk in pectin until dissolved. Bring to a boil over high heat, stirring frequently. Add sugar all at once and return to a full rolling boil, stirring constantly. Boil hard, stirring constantly, for 1 minute. Remove from heat and quickly skim off foam. LADLE hot jelly into hot jars leaving 1/4 inch headspace. Wipe rim. Center lid on jar. Apply band and adjust until fit is fingertip tight.